We offer a full line of new radiators and heater cores. 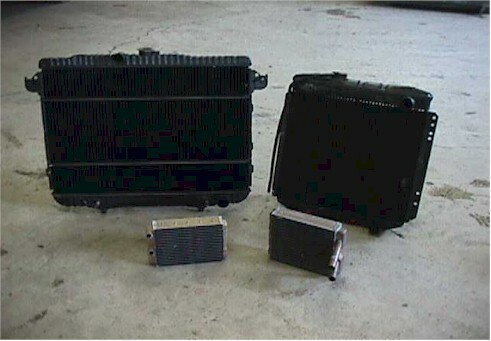 RJR Radiator is your cooling system specialist. When your car comes in for problems with heating or cooling system problems, the first thing we do is a complete cooling system inspection. After our inspection, we will call you with any problems we find and then allow you to make the decision on how you would like us to solve your problem. We offer a full line of new heaters and radiators as well as condensers and evaporators which are of the highest quality and availability with local suppliers of brand name new cores and completes. All of our radiators come with a limited lifetime warranty. All of our labor comes with a 90 day warranty. However, if your radiator doesn't need to be replaced, we can perform one of several options: rod-out (instead of boil-out), re-core, or repair. We also replace cracked plastic tanks on plastic tank radiators. Our radiator shop manager has over 23 years of experience with radiator service, and our service manager has been in the business for over 20 years. We have the knowledge to assist you with any problems you may have.